You would have thought that Russell Wilson the quarterback of the Seattle Seahawks would have been jumping for joy. After all his team had just advanced to the Super Bowl with an amazing improbable come from behind win over the Green Bay Packers. Down 19-7 with 2 minutes and nine seconds left the Seahawks scored a touchdown to make the score 19-14. Everyone knew that their only hope was an onside kick. 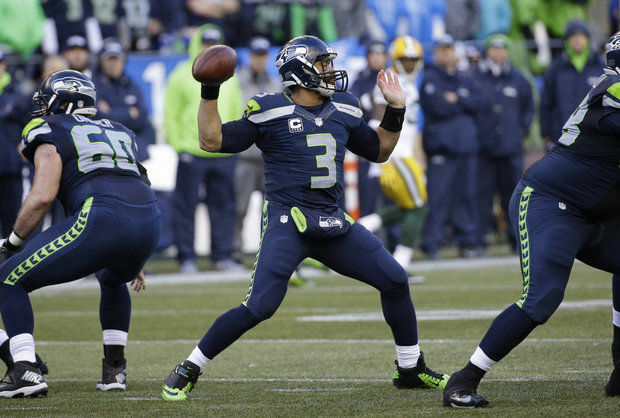 Incredibly the onside kick bounced off of a Packer player and the Seahawks recovered. Before you knew it another Seattle touchdown made it 20-19 Seattle. Seattle went for a two point conversion and Russell Wilson was rushed and was running backwards as he tossed the ball way up in the air. Incredibly a Seattle player jumped up and caught it for the conversion. Trailing by three points the Packers came rallying back and kicked the game tying field goal forcing overtime. Wilson who was having a miserable game through the first 57 minutes of play threw a 35 yard touchdown pass that ended the game and left him reacting very unexpectedly. 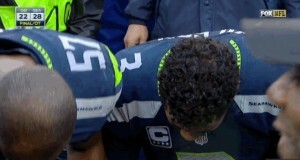 Tears were rolling down his face during the prayer huddle. After NFL games Christian players get together for a prayer. It is decided that win or lose the prayer will take place. The TV cameras grudgingly give us a shortened view. Both the winning and losing teams are represented. It is a statement that we have only played a game and we are all winners because of our faith in Jesus Christ! The huddle symbolizes that there is someone far more important in our lives than football. Football is our job and we do our best to win the games but we represent someone who is far bigger than any game. Most of us have seen the prayer huddle after games. Few realize how the huddle got started. It was a game where the New York Giants played the San Francisco 49ers in 1990 in San Francisco. As Brent Jones the 49ers tight end stated “Guys from both teams just wanted to make a statement, it caught fire from there.” So what is said in one of these meetings after the two teams have pounded each other into the turf for sixty minutes? “A guy from either team will offer up a prayer of thanksgiving and for getting through the game healthy”, Jones stated. It’s amazing how often before the interview on national TV starts a player will shun the greatness everyone is willing to place upon him with the statement “I’d like to give all of the glory to my Lord and Savior Jesus Christ!” The late Reggie White nicknamed, The Minister of Defense, took his belief one step further in the 1990’s as he and his defense led the fans in a chorus of Amazing Grace during a TV time out in the NFL championship game at Lambeau Field. “It was incredible”, stated Pat Richie who was the evangelical chaplain for the 49ers. 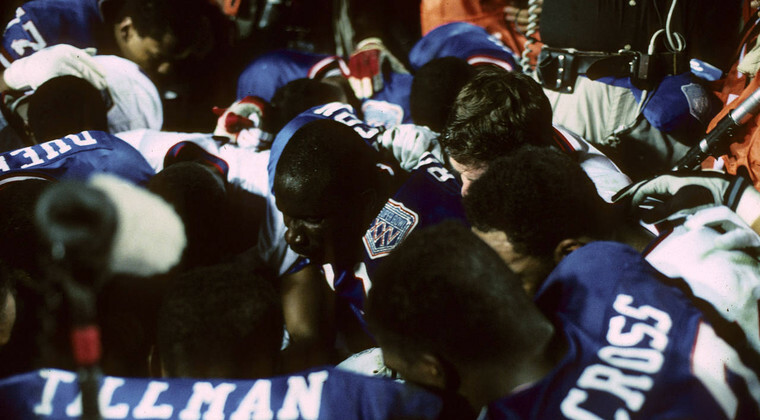 “The defense was down there conducting the choir.” Richie has a picture of the first Candlestick Park prayer huddle hanging in his Alamo office as a reminder that it all got started here. While we see the games as spectators as fun and exciting, for the players there is a lot of stress involved. For every player who seemingly is secure in their jobs there are so many that could be cut at any time. When the thrills of the fast cars, big money, and fast life fade it is human nature to look for some kind of stability. Many have found stability in Jesus Christ and on every team there are leaders that can steer them in the right direction! Russell Wilson is going in the right direction these days. Last year his team won the Super Bowl and this year they are back defending their title. No matter what the outcome of the game look closely. There will be a lot of distractions around the big game. There will be funny commercials, a celebrated halftime performance, announcers singing praises, and dancing touchdown moves. The game will end like all of the past Super Bowls where one team will be glorified and the other disheartened. For all of the glory and fame that moment brings it slowly fades. Who won the Super Bowl in 2000? How about 2010 for that matter? Unless you are a fan of the team that won you might have trouble remembering who won the Super Bowl two years ago. Yet there is something that Russell Wilson said as he was about to get interviewed after his victorious touchdown pass. “God is so good”, he stated through his tears. There is a growing number of NFL players that feel the same way. You will notice the prayer huddle after the big game. The TV camera may glance over it quickly so keep your eyes peeled. The shine from the big game will pass and the glory fade. In a quiet circle God’s huddle will take place. Representatives from both teams will hold hands and a solidarity thankful prayer will be made. Though their uniforms may be different their ultimate victorious team is the same! Really enjoyed reading your post. I did not know all the facts behind the huddles before. I am so glad to see that some players are truly living out their faith and giving God the glory. Thanks for writing this.